160–hours of clinical, research and didactic experience, including 50% devoted to clinical shadowing with primary care doctors in healthcare facilities with patients; 40% devoted to research where data collection, interpretation, and presentation is expected; and 10% devoted to seminars, a campus tour, the Admissions Forum and Mock Interviews. These components are delivered over a 4-week period, historically in the month of July. The selected applicants are expected to reserve all of their time, energy, and attention for the PTMS program while engaged in the various components. Students will shadow primary care physicians. Typical encounters and responsibilities of the physicians are experienced and conveyed in this “hands off”, “eyes on”, “ears open” approach to introducing the student to serving in a rural and/or medically underserved area. Pathway students will be divided into small groups and will collaborate on researching an assigned topic that is relevant to the needs of southwest Georgians. The topics are identified prior to the students’ engagement in the program. Data collection will be a shared venture between all the groups. Interpretation and presentation on assigned topic will be conducted by each group. A Research Coordinator will guide and provide assistance throughout the research process.. In late Fall, the Georgia Academy of Family Physicians (GAFP) hosts an annual Scientific Assembly Symposium in Atlanta. PTMS research projects are submitted for presentation and competition with other research projects from around the state. SOWEGA-AHEC Pathway students have received placement awards in past years, and remains a motivating factor in producing viable research projects.. The mock interview experience has proven to be one on the most helpful components in the Pathway program. It reduces anxiety and increases confidence for the medical school admissions interview. During these practice scenarios, admissions representatives, residency directors and practice managers interview the students exposing them to real medical school interview questions and practices. The interviewers provide students with relevant feedback and current interviewing and acceptance trends, including tips on how to best prepare and improve their personal interview skills. 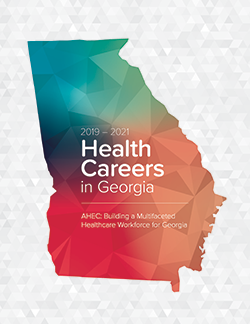 SOWEGA-AHEC provides the only forum where admissions officers from each of the Georgia medical schools attend. This unique experience provides the PTMS participants, as well as the community and online participants, an opportunity to learn about and ask questions of each of the medical schools in a single setting. Deans of Admissions or their representatives discuss issues relevant to the admissions process and being a competitive applicant as well as answer questions from the live and online participants. The Admissions Forum is recorded and available for viewing. Additionally, an interactive luncheon is scheduled between the PTMS students and the Admissions Deans prior to the start of the Admissions Forum. Several seminars with guest speakers deliver information addressing topics relevant to a medical school applicant. Topics vary each year but usually include: MCAT preparation, personal statements, financing a medical education, the do’s and don’ts of interviewing and telehealth.